I had a titter at Jimmy Carr’s contribution in yesterday’s Twittersphere column in ‘i’: Osama Bin Laden – jihad it coming. What is going on in the world right now? In the Arab world, Libya, Syria, Egypt in revolt against years of patriarchal oppression. In London today, as the inquest into what really happened on 7:7 comes to a conclusion after 5 months of evidence, and despite the criticisms about the response of the emergency services and security services to deal with the situation, and the Coroner’s conclusion that these failures were not responsible for the death toll, I have my doubts. 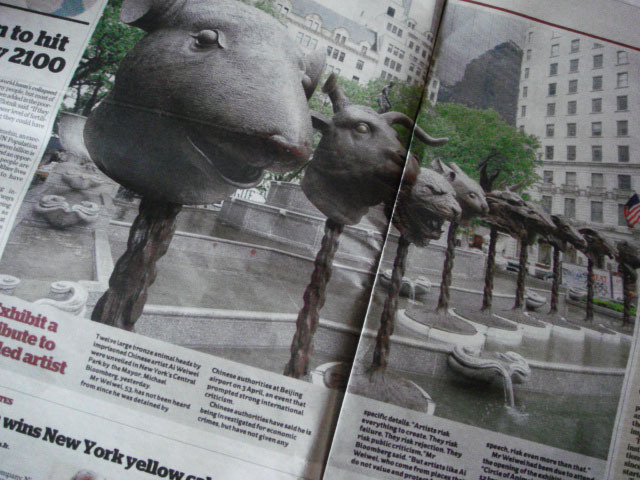 New York’s Central Park’s Mayor, Michael Bloomberg, in response to the new sculpture piece of 12 bronze animal heads representing the figures of the Chinese Zodiac by artist Ai Weiwei called “Circle of Animals”, saying: “Artists risk everything to create. They risk failure. They risk rejection. They risk public criticism. But artists like Ai Weiwei, who come from places that do not value and protect free speech, risk even more than that.” Mr Weiwei, 53, has not been heard from since he was detained by Chinese authorities at Beijing airport on 3rd April.